Ever go to the store and come home with a bouquet of flowers, put them into a vase, and think, "This doesn't look right"? 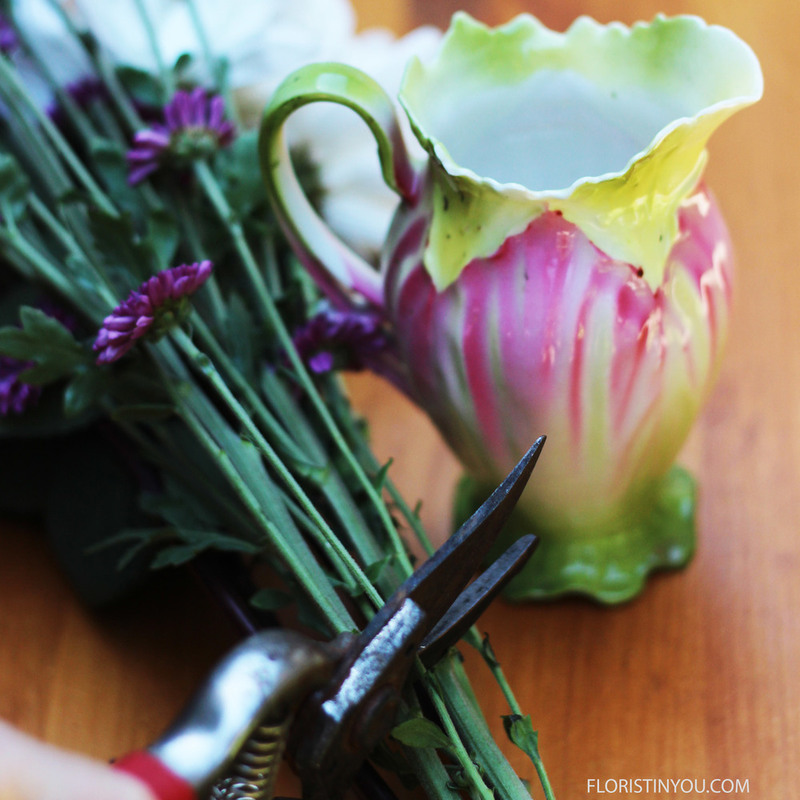 Follow these steps to make a beautiful little arrangement. Start at home with the vase. I chose to use this vintage porcelain creamer that belongs to my good friend, Carolann. It is hand painted with pinks and greens. You might look in your china closet for a vase. I found this lovely little porcelain bird in my china cabinet to display with the vase. Take a picture of your vase with your phone and then go to the store. 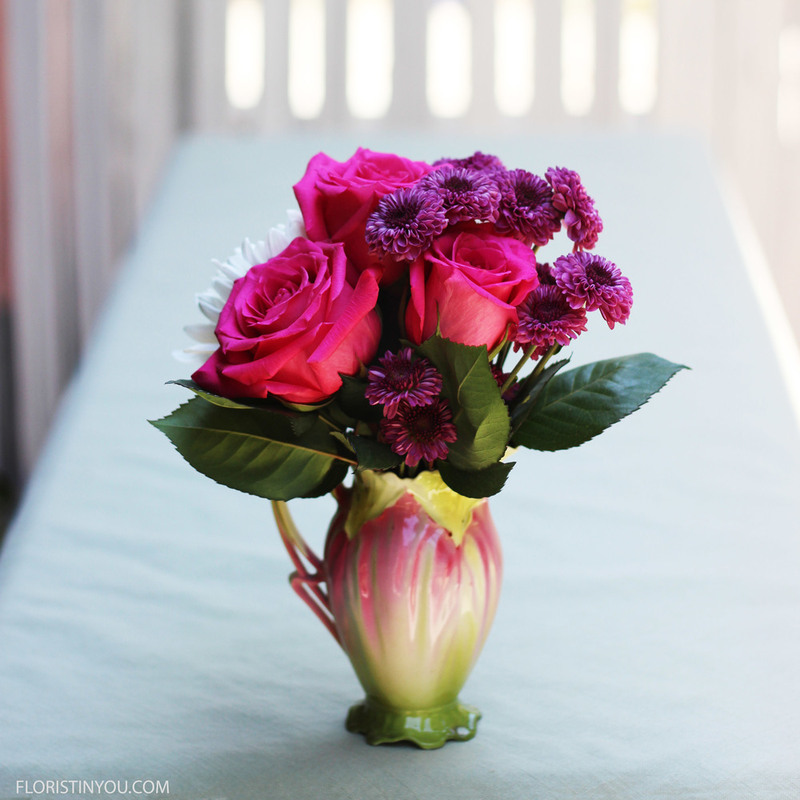 Pull your photo up and match the colors in the vase to the flowers. You don't have to do an exact match. You could also choose complimentary colors. Those of you that paint know that complimentary colors are opposite each other on the color wheel. You can do an on-line search for a color wheel as see for yourself. The complimentary color to orange is blue, the complimentary color of red is green and the complimentary color of yellow is violet. I chose to use matching colors and used a pink like in the vase, along with lavender and white. Choose a bouquet size that will fit your vase. This is a small creamer and didn't need many flowers, so I chose a small bouquet. Well go ahead, find your vase, get your flowers and let's begin. It's that easy. 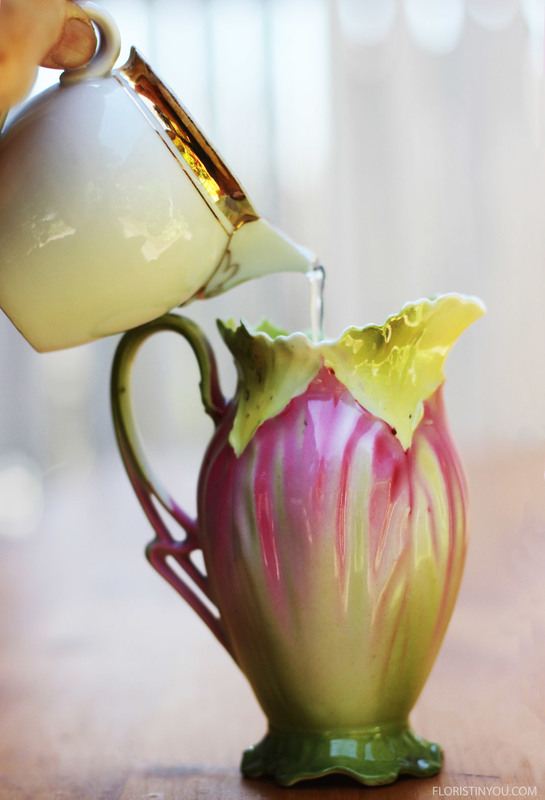 Fill your creamer with water to a couple inches below the top. 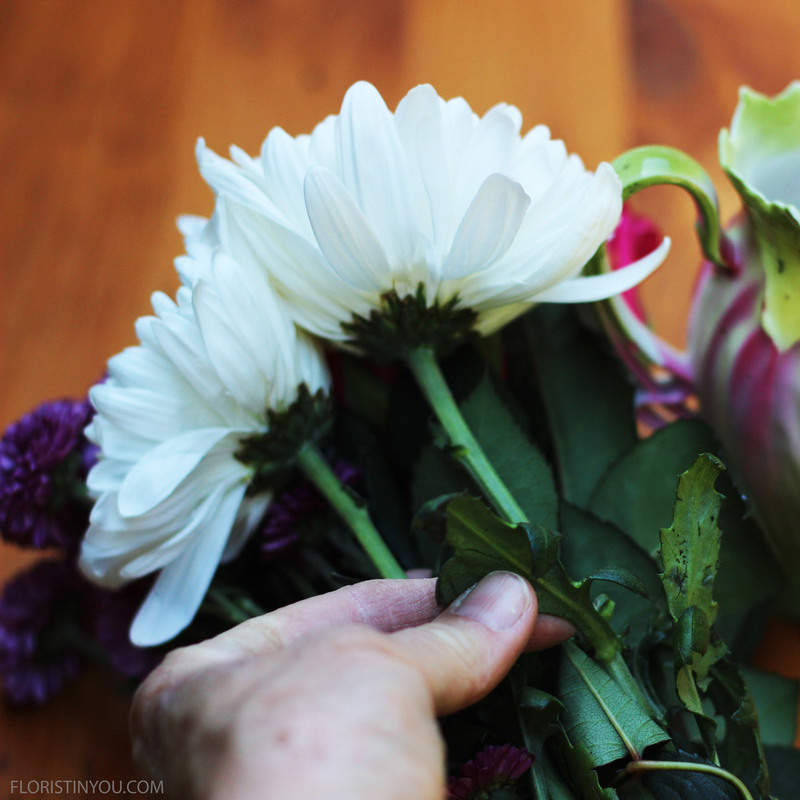 Choose a bouquet size to fit the opening of your vase. Carefully pull off any straggling petals. Pull off all leaves that will be below water. Snip any flowers that will be below the water. Save them. Wire your roses. See My Best Secrets, then When you get Home from the Mart. 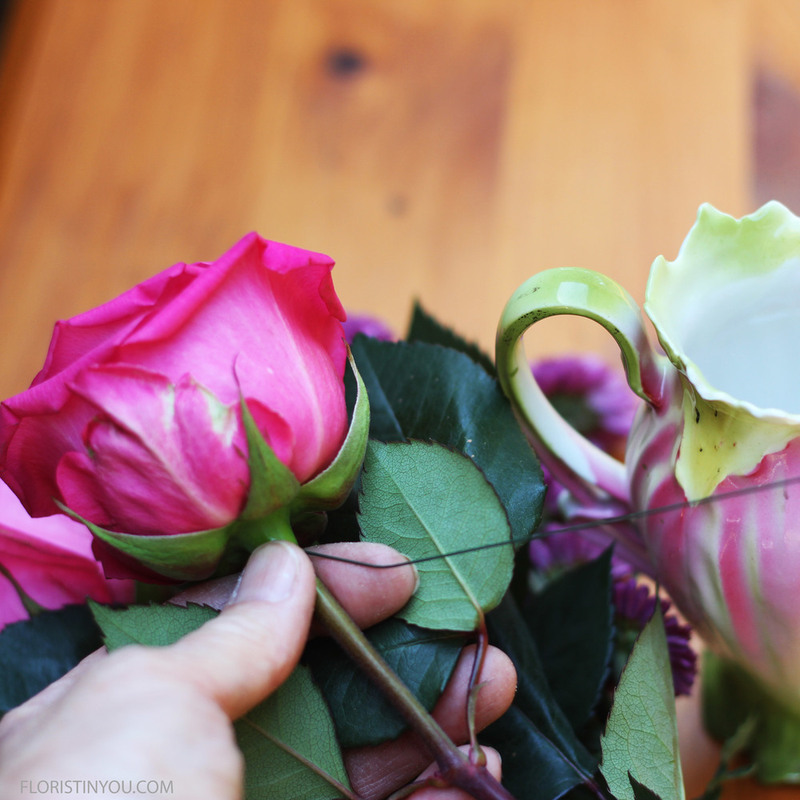 Hold flowers to side of vase to measure. Cut. Lowest rose was about 1.25 inches above rim. Put flowers in vase. Then add shorter flowers you saved in the front. What do you think Miss Elle? Do they smell? Oh no! 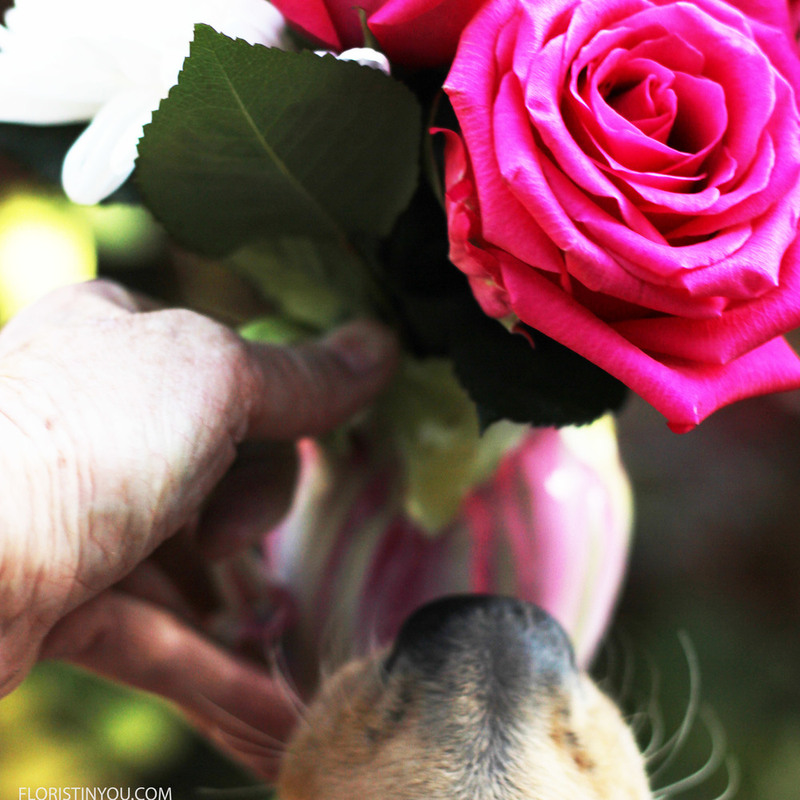 She jumped up and bit the rose! You were supposed to smell it not bite it! Silly dog. We will let the bird smell it. Well you are done. Pretty as a picture.